1. 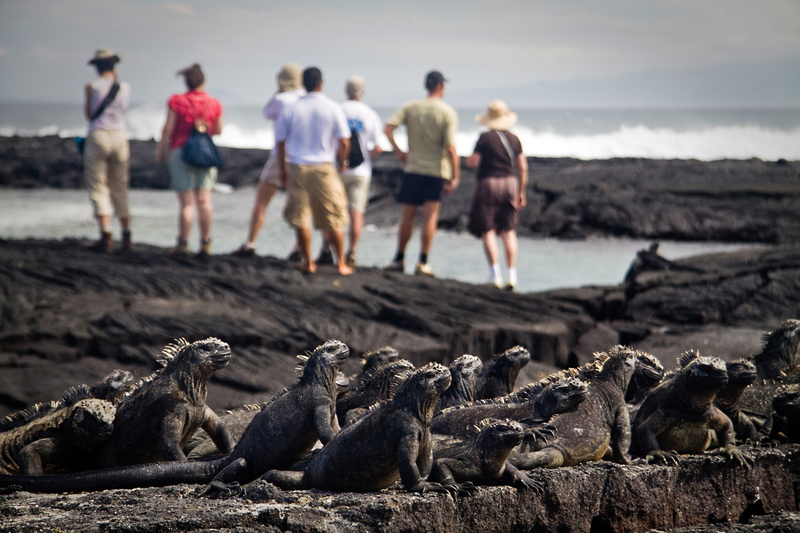 The Galapagos archipelago is perhaps one of the most bio-diverse places on earth. Ninety-seven percent of the islands are a national park and half of the land species (and one fifth of the marine species) are endemic to the Galapagos. 2. Set 1000 kilometres off the coast of Ecuador on a three-way tectonic plate junction, the Galapagos Islands are made up of 13 major islands, 6 minor islands and 40 islets in the Pacific Ocean, which are the result of numerous volcanic eruptions – including 13 in the last 100 years. 3. While the mention of the Galapagos Islands may conjure up images of bizarre and unique wildlife, the islands are actually home to 25,000 human inhabitants too, who live in small communities dotted across the islands. 4. Up until 2012, the Galapagos Islands were home to the sole remaining Giant Pinta tortoise in the world that was known affectionately as Lonesome George until his passing. While his actual age was never certain, he was estimated to be between 90-100 years old. 5. The Equatorial, Panama, Cromwell and Humboldt ocean currents converge at the Galapagos Islands resulting in its often unpredictable tidal patterns and water temperatures. 6. First capturing the imagination of famous British Scientist and Theorist Charles Darwin in 1835, the Galapagos Islands became the major source of research and inspiration for his paper The Origin of the Species and the theory of evolution. 7. The Galapagos Islands are known as being home to anomalies – such examples include the Galapagos Penguin, the only of its kind to be found in the Northern Hemisphere; the Galapagos Marine Iguana, the only lizard in the world with the ability to swim; and the only non-flying cormorants in the world, we’ve evolved to such a large size they are no longer able to fly. Plus, don’t forget the world’s only colony of red-footed booby and the carnivorous 30cm long centipede, among others! 8. Espanola – the oldest island in the Galapagos is estimated to be 3.5 million years old, while the youngest – Fernandina, is just 1 million years old and still forming! 9. Floreana Island was where the Galapagos had its first post office – a barrel where those who passed through the bay could leave mail or take any they could deliver. Today the tradition is kept alive by tourists, where you can send a letter from Post Office Bay without stamp – all you have to do in return is pick up a letter that is directed to where you live. 10. Thanks to its location on the Equator, the Galapagos Islands have an equal 12 hours of daylight and 12 hours of night throughout the year. Explore the Galapagos Islands for yourself on board a cruise boat, hopping from island to island, discovering what makes it so special. We're an international team of travellers based all over the world from London to Brisbane, Vancouver to Johannesburg, Auckland to Sydney. We're an eclectic mix of English, Australian, Indian, Canadian, Polish, South African and New Zealanders in the team and we love to travel the world, be it for work, pleasure or often both. Our collective travel experiences are extensive and through our blog we share all our adventures and insights with you - we hope you enjoy our posts!